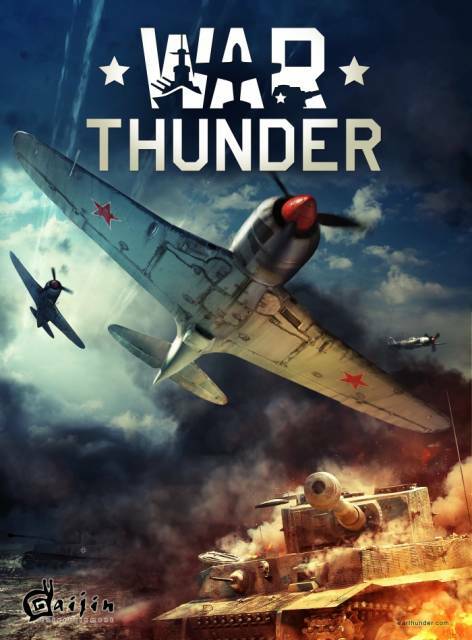 War Thunder is a free-to-play air combat game set in the World War II and Korean War eras. Naval and land battles are planned additions. War Thunder is an MMO-style combat game taking place during World War II and the Korean War between 1939 and 1953. Like its primary competitor WarGaming.net, War Thunder will eventually span all three major types of warfare (aerial, naval, ground). The first type being focused on is aerial combat. The aerial portion of War Thunder was originally called World of Planes. The name was changed due to perceived confusion with WarGaming.net's World of Warplanes. It features period accurate planes and locations from 1939 to 1953. Many historical battles from the second world war and the Korean war are represented as maps. There are multiple difficulty modes depending upon how much realism you desire. Arcade mode is essentially a more simplistic multiplayer shooter while historical battles mode will require more advanced techniques like taking off and landing during battles and realistic damage modelling. There are five countries represented in War Thunder; United States, United Kingdom, Soviet Union, Japan, and Germany. There are two more planned countries which have yet to be included in the game; Australia and Italy. Each have their own unlock trees and sets of planes. As one is levelled, that progress is not transferred to the others. Within each nationality the player has a hangar holding 3-7 planes of their own with many levelling and customisation options. Researching planes and upgrading crews use a mixture of various currencies; some earned in gameplay, some purchased with money. The War Thunder aerial alpha ran from October 2011 to March 2012. Crashing without a tail in the beta. The closed beta began in March 2012 and concluded in October 2012. On Nov. 1, 2012 the game entered open beta. Gaijin Entertainment has stated the stats and progression earned by players during the open beta will not be reset when the game goes into full release. Purchasable upgrades and currency were also live as of the open beta. The game is downloaded via Gaijin's website as a free client, but on Feb. 26, 2013 the game passed Steam Greenlight and is due for release in the coming months. Here is a list of currently available and planned aircraft as of the beta release. Italics = Planned, but not in yet. Bold = Premium Content. The naval combat portion of War Thunder will focus mostly on small water navies, featuring vehicle types such as torpedo boats, river boats and gun boats among others. The decision to focues on small water navies instead of full-blown capital ships was made because the developers found it hard to make the latter fit within the game; a realistic approach resulted in matches taking far too long, but speeding the ships up made it too arcade-y and unrealistic. Naval combat were first announced on the 12th of August 2016 along with two premium vehicle pre-order packs that included access to closed bre-beta testing. It was also announced that unlike ground forces, naval combat would launch with all five nations at the same time. The first closed pre-beta test was held on the 2nd of December 2016, with another following a few days later. The first three countries that will have playable ground vehicles are United States, Germany and the Soviet Union. The other countries will be added over time. Here is a list of the currently confirmed set of vehicles.